Happy Travel Tuesday! Haven’t been to Niagara Falls? Not to worry! Our Niagara Falls motor coach tour remains as one of the most popular bus tours from Nebraska we offer. We’ll take you to the Canadian side of the falls (no offense to the U.S. side), we just think it adequately showcases how picturesque and powerful the falls really are. 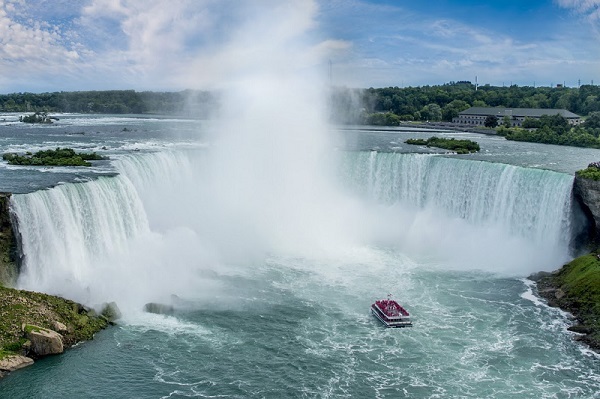 You’ll get an up-close-and-personal view of the falls on your Hornblower Niagara Cruise, as well as a birds-eye-view atop Canada’s Skylon Tower – two experiences you won’t soon forget. After all, we did take a total of 409 people to beautiful Niagara Falls in 2015. Our senior discounts make it even more accessible! Click HERE to take a look at some of the pictures we took from 2015 or click the picture below to go to our Niagara Falls 2016 Tour Page! This entry was posted in Latest Tours and tagged bus tours from Nebraska, motor coach tour, senior discounts on March 31, 2016 by Moostash Joe Tours. There’s really no better (or cheaper) time to travel internationally than now! And what better way to travel abroad than to have your airline tickets, hotel accommodations, delicious local meals and exciting attractions already booked for you! Let our years of experience take you to the best areas and guide you to the local treasures you ordinarily wouldn’t see. Make 2016 your year to experience another country’s sights, sounds, cuisines, people and culture! Below is a brief description of each of our Moostash Joe Tours international and airline tours for 2016. Extended deadline! Spend 7 nights aboard the NEW cruise ship, the MS Amadeus Silver, as you travel Europe’s second longest river, the Danube. Take in the sights of 5 unique European countries: Czech Republic, Germany, Austria, Slovakia and Hungary. Also spend two nights in Prague! Space is limited, click the link below or the picture for more information. Tour Registration Deadline is April 8! This exclusive cruise through Alaska’s Inside Passage is sure to be one for those nature lovers! Also visit the amazing cities of Anchorage, Juneau, Skagway and Ketchikan. Spend 7 days aboard your Glacier Cruise, experiencing the fresh sea air, a wide variety of shipboard activities, and an experience you’ll treasure forever. Fly into Frankfurt, Germany and visit some of the most unique German cities and towns on your cruise on both the Rhine and Moselle Rivers. See Germany’s steep vineyards, pastoral towns and stately castles! Take in some beautiful fall weather as well as some delicious European cuisine. Speaking of St. Patrick’s Day…head on over to where it all began! Our Ireland tour continues to be one of our most popular international tours year after year. Visit Dublin, Galway, Killarney and Cork – along with the unique Celtic culture of castles, abbeys and coastal communities Ireland is famous for. A NEW offering for 2016! Enjoy a 7 night/8 day cruise aboard the luxurious Avalon Creativity. Travel from Paris through France’s quaint and picturesque countryside to Normandy Beaches. Learn about the regions rich history, get a peak at the famous Eiffel Tower and much, much more! Featuring a cruise on magnificent Lake Garda; the beauty of Venice; the Renaissance City of Florence; the amazing landscapes of Tuscany; and the eternal city of Rome! Not much more needs to be said! Brand NEW for 2016! Experience some of the richest heritage in the world! Travel across the Bohemian countryside, visit numerous medieval castles, towns and churches and spend 4 nights in one of the world’s most impressive capital cities, Prague. This entry was posted in Announcements and tagged international tours, Moostash Joe Tours on March 18, 2016 by Moostash Joe Tours. The numbers are in! 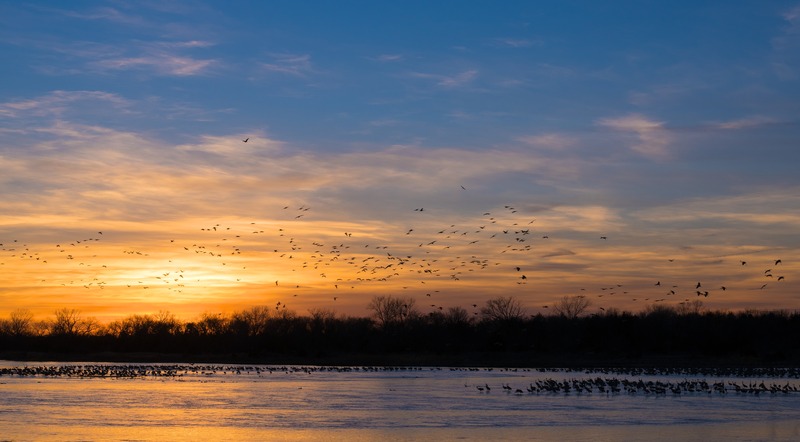 At last count, there were already 213,000 cranes along Nebraska’s Platte River, the most in over 18 years at this time! Experts are saying because of the warmer weather, the peak of the migration will be sooner. Fortunately, a family of cranes stay for about three weeks, putting our tour on March 15-16 at a great time! If you’re interested in seeing one of the greatest migration spectacles in North America, don’t wait any longer! There’s still time to get on the tour but there are just a few SEATS LEFT! Below are some highlights of our Sandhill Crane Migration Tour, March 15-16. A 360-degree view of the Sandhill Cranes’ evening return at the Crane Trust Nature and Visitor Center! It’s not too late to join our bus tour from Nebraska! Our senior discount is still available as well! Click HERE to see the tour details. This entry was posted in Latest Tours and tagged bus tour, bus tour from Nebraska, senior discount on March 10, 2016 by Moostash Joe Tours.